Polish: Learn Polish in a Week! Have you always wanted to learn how to speak Polish but simply didn’t have the time? Well if so, then, look no further. You can hold in your hands one of the most advanced and revolutionary method that was ever designed for quickly becoming conversational in a language. In creating this time-saving program, master linguist Yatir Nitzany spent years examining the twenty-seven most common languages in the world and distilling from them the three hundred and fifty words that are most likely to be used in real conversations. 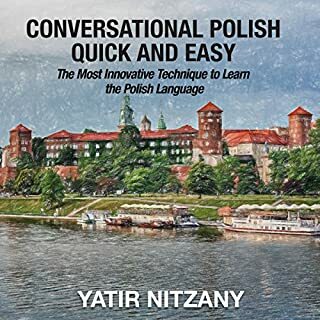 This audiobook is a completely new way to learn Polish vocabulary fast - and for free! 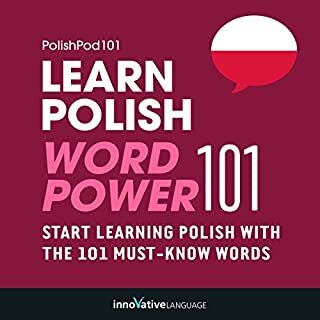 Start speaking Polish in minutes with the powerful learning methods you will master in this audiobook. The vocabulary words you'll find in Learn Polish - Word Power 101 were hand selected by our Polish language teachers as the top 101 most frequently used words in the Polish language. Hear the word to master the pronunciation. Welcome to Everyday Polish for Beginners - 400 Actions & Activities by Innovative Language. This audiobook is a new way to learn and speak a language fast. Start speaking in minutes with powerful learning methods that you'll learn inside. Using this audiobook is simple. You'll learn practical phrases for over 400 daily activities through 10 easy chapters. The phrases were chosen by a panel of professional language teachers and are some of the most frequently used phrases in daily conversation. Easy Learning Polish teaches you key words for the most important situations and lets you expand your language through a variety of activities. You choose whether to focus on learning the essentials or to progress to some more challenging activities – so whether you’re a beginner, or you want to refresh and build upon your existing knowledge, you can become confident in Polish without even having to pick up a pen. This audio course is pertinent for your trip. Start speaking Polish in minutes, and learn key vocabulary, phrases, and grammar in just minutes more with Introduction to Polish. Our native Polish hosts break down all the sentences, grammar and more in a simple, easily understandable way! This isn't stale textbook material - it's fun, effective, and practical! You learn basic beginner Polish conversation that you can use immediately! Polish Phase 1, Units 1-5 build on material taught in prior units. Each lesson provides 30 minutes of spoken language practice, with an introductory conversation, and new vocabulary and structures. Detailed instructions enable you to understand and participate in the conversation. Start speaking Polish in minutes, and grasp the language, culture and customs in just minutes more with Survival Phrases - Polish, a completely new way to travel with confidence! Survival Phrases - Polish will have you speaking with proper pronunciation from the very first lesson and arm you with cultural insight and other information to utterly shock and amaze your friends travel companions and people you meet along the way. Make more of your holiday ! Learn Polish: Must-Know Polish Slang Words & Phrases by PolishPod101.com is designed for beginner-level learners. You learn the top 100 must-know slang words and phrases that are used in everyday speech. All were hand-picked by our team of Polish teachers and experts. Do you want to learn Polish the fast, fun and easy way? Then this huge audiobook compilation is for you. Learn Polish for Everyday Life is for people who want to finally speak and use real-life Polish. You learn the must-know conversational phrases, questions, answers, social media phrases, and how to talk about your everyday life in Polish. All words and phrases were hand-picked by our team of Polish teachers and experts. Learn Polish: A Complete Phrase Compilation for Traveling to Poland is designed for Absolute Beginner learners and travelers. You learn the must-know travel phrases, survival phrases, vocab and cultural insights to make your trip to Poland a breeze. All were hand-picked by our team of Polish teachers and experts. The breakdown of Europe's Eastern Bloc proves that the map of Europe cannot be redrawn merely to serve political ends. Perhaps no country illustrates this more clearly than Poland, whose borders often have been a negotiating tool of the Big Powers. These presentations enlighten our understanding of the current drama in Eastern Europe. Taste of Poland ? not entirely !! Are you relatively new to learning Polish or need to brush-up on your language skills? You wish to not only talk like a native, but also understand them clearly? Welcome to Polyglot Planet. We provide you with the right tools, energy and motivation for you to understand and speak Polish confidently. Polish Phase 1, Lessons 1-30 includes 15 hours of spoken language practice and one hour of reading instruction in thirty, 30-minute lessons. In the first 10 lessons, you’ll cover the basics: saying hello, asking for or giving information, scheduling a meal or a meeting, asking for or giving basic directions, and much more. In this sweeping novel, James A. Michener chronicles eight tumultuous centuries as three Polish families live out their destinies. With an inspiring tradition of resistance to brutal invaders, from the barbarians to the Nazis, and a heritage of pride that burns through eras of romantic passion and courageous solidarity, their common story reaches a breathtaking culmination in the historic showdown between the ruthless Communists and rebellious farmers of the modern age. Learn Romanian in 7 days! At Project Fluency we believe that in order to communicate well you only need to know the basics of any language well. For this reason our expert linguist team has researched the most useful Romanian phrases, grammar rules and words. So don't you don't waste your time and energy on things that just simply don't work. If you're ready to learn Romanian today, then download this book, and take the first steps to get the most out of your Romanian experience! Are you planning a trip to Poland? Are you moving to Poland? Do you have Polish heritage? Be honest: How cool would it be if you knew Polish? Look, it's a fact: If you know a bit of the local language, your trip will always be a more enriching experience! People will smile and be more cheerful if you took the time to learn their language. Don't be your average tourist - stand out! Maybe you want to impress a beautiful Polish woman? At Project Fluency we believe that in order to communicate well you only need to know the basics of any language well. For this reason our expert linguist team has researched the most useful Polish phrases, grammar rules, and words. So you don't waste your time and energy on things that just simply don't work. Ready to learn Polish today? Get the most out of your Polish experience! Ukrainian: Learn Ukrainian in a Week! Start Speaking Basic Ukrainian Quickly! This is book is highly recommended for all who wanted to learn polish language. This book will help you to manage your time instead of going to language school everyday, just play this audiobook and all you wanted to know polish words were all be heared in this book.You will never regret when you buy this audiobook. I Enjoyed my time. Polish one of the more difficult languages to learn unlike French, Italian, etc.....the level and simplicity of this book is a real asset. A good take-with for travel. Great book learning Polish language and makes me confidently talk with polish language. I love hearing this book! Thanks to the author for sharing this such an educational book! Good narration and I am entertained very well!! I learned a lot from this book, I am excited to share this book to my friend and family. Clear approach to learning the Polish.. This book is well organized and gives a great overview of the verbs and all tenses. The Polish verbs are organized the narrator delivers the word so well. Good way to start learning! Great book teaches one to tap in to their fullest potential and excel their work style. This book is great to learn about time management and I would recommend this. lots of useful polish words! 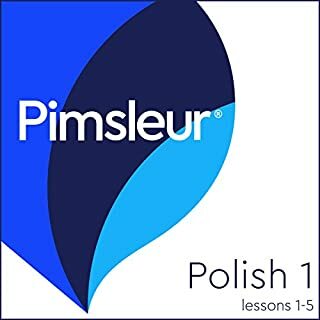 unlike the pimsleur reinforcement training, this audiobook provides lots of great words you should know and train for thorough polish k pledge, including lots of slang and risquee words at the end!